I was made aware of this interesting use of material by my model making colleague Kathy. 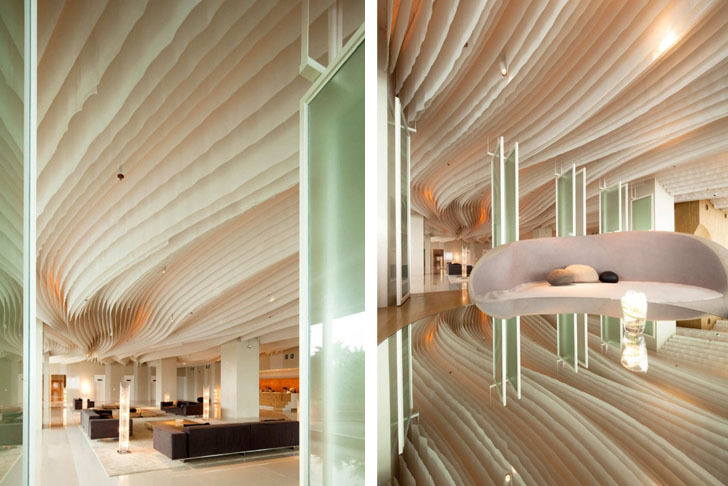 She pointed out to me that the ceiling was made from natural fabrics to give a feeling of flowing water in the main lobby area. I was strongly be considering using this material in my next design close to a waterfront. I followed your comment by looking up or Googling: Thailand Hilton Hotel Natural Farics. There are more images there and on Architecturefeed etc,. Sorry. I see it was't a comment as such, never mind! Architecturefeed shows us Arga.com - Natural History Museum of Utah by Ennead Architects and GSBS Architects.